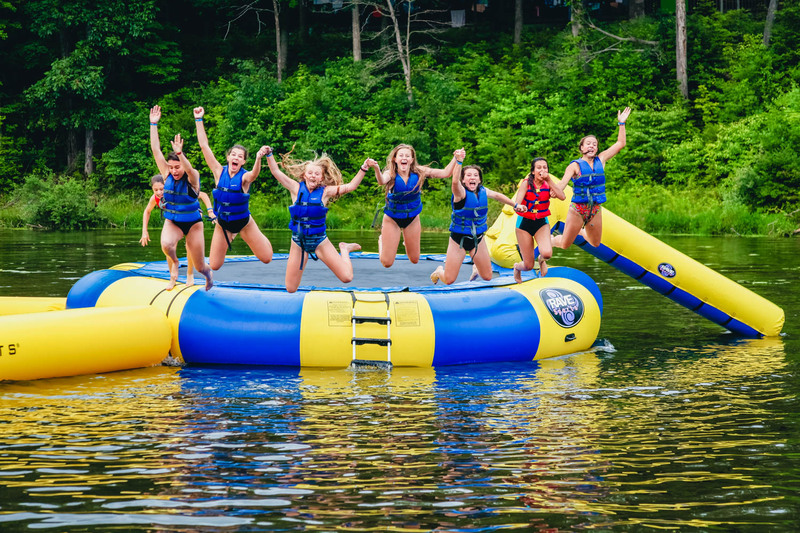 Spanning over 650 acres, Camp Tecumseh’s beautiful outdoor setting provides the perfect backdrop for an unforgettable summer camp experience, a weekend retreat, or a hike through the woods. Our facilities aren’t just buildings, they are intentionally designed to work in concert with our natural surroundings. Our facilities inspire creativity and imagination, promote friendship and skill-building, and immerse our guests in environments where they can play, love, learn, relax, and connect. 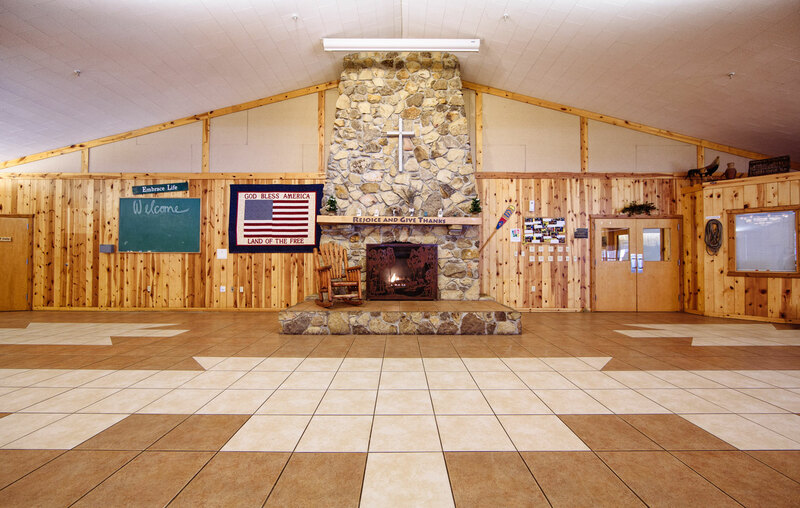 The signature meeting place at Camp Tecumseh. 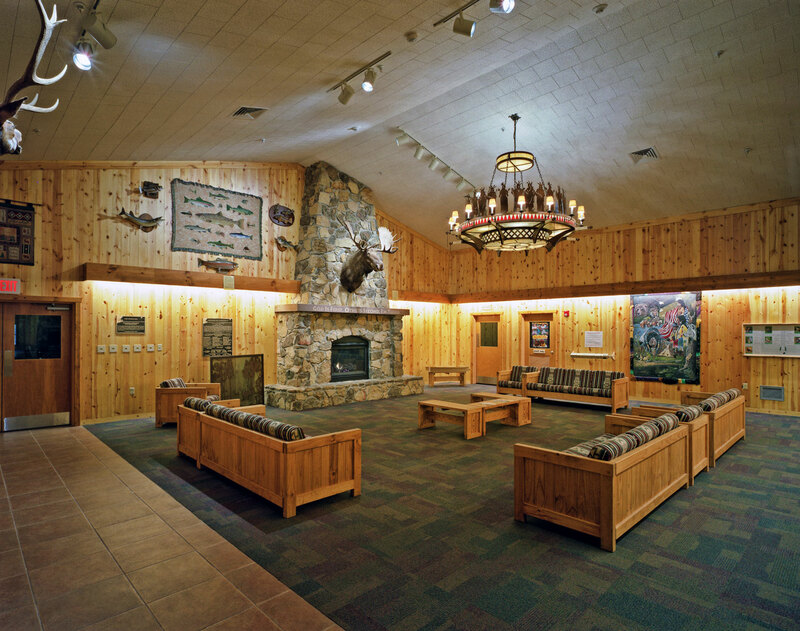 Kampen Lodge expertly blends an aesthetic charm rooted in camp’s rustic heritage with 21st century capabilities. 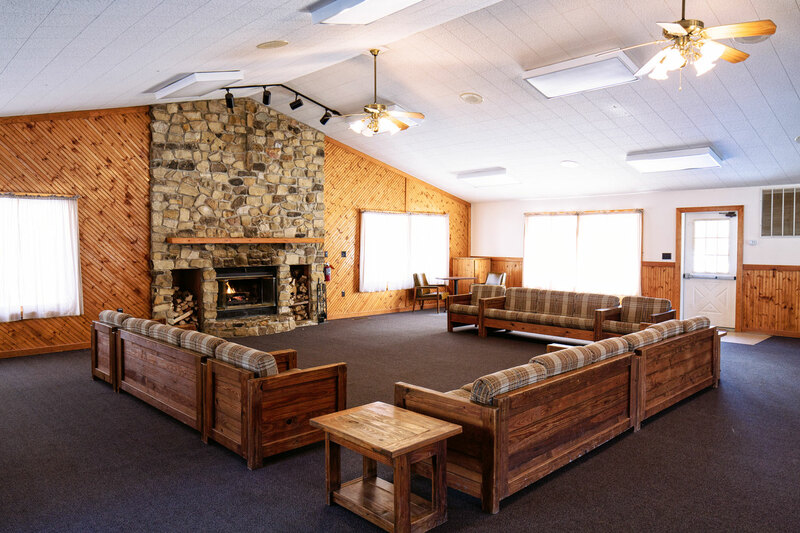 With four distinct spaces including an ample wrap around porch, and the technical features of most small concert venues and amphitheaters, Kampen Lodge is perfectly suited to accommodate a wide range of groups and activities. 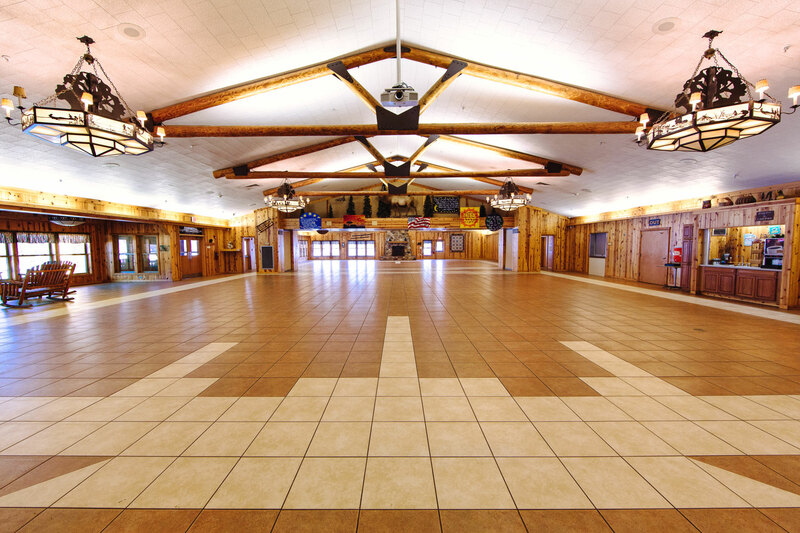 The largest meeting space at Camp Tecumseh, Kampen Lodge’s main room can accommodate up to 600 guests. 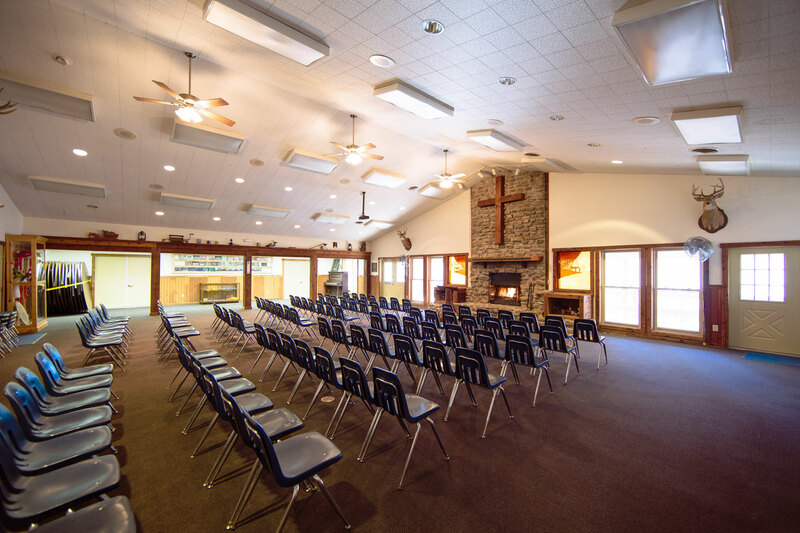 From conference keynotes to church services, the main room is perfect for large groups and those looking for lots of space. Hundreds of chairs and dozens of tables are available for limitless room configurations. High speed wireless Internet, high definition projectors, artful lighting, a sizable stage, and concert quality sound featuring numerous inputs and wireless microphones take your group’s activities to the next level. For campers and school groups, you’ll find everything from crafts to performing arts, indoor games to presentations. A challenging indoor climbing wall reinvigorates rainy days and clever details hide behind every corner waiting to be discovered. Breakout spaces don’t get better than this. 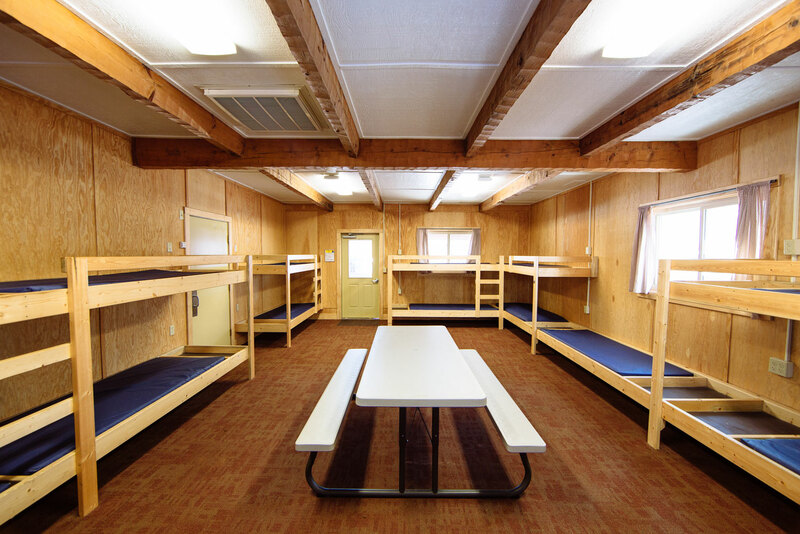 With room for up to 25, the Two Sisters Library is perfect for smaller groups. 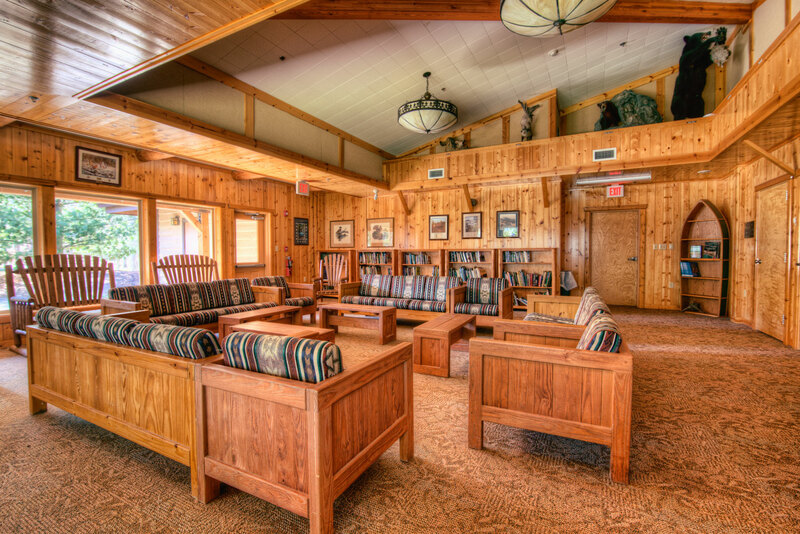 Panoramic windows which provide excellent views of Camp’s natural wildlife, comfortable seating, and rows of books combine to create a cozy setting that encourages creative thinking and lively discussion. An HD projector and screen, high speed wireless Internet, and paper easels are available in the Two Sisters Library. During the summer, Two Sisters Library is home to clinics such as guitar and sign language, and on rainy days is the perfect place to make friendship bracelets. Two rooms separated by a collapsible wall, Griffith North and South can each accommodate up to 100 guests. When more space is needed, the Griffith rooms easily combine to form one large room. With flexible room setups, the Griffith rooms are perfect for activities ranging among small group discussions, breakout sessions, and active teambuilding. HD projectors with screens, high speed wireless Internet, and paper easels are available. A collapsible wall separates the Griffith Rooms from Kampen’s main room, and can easily be torn down to create maximum space. A warm and comfortable place to meet and dine. 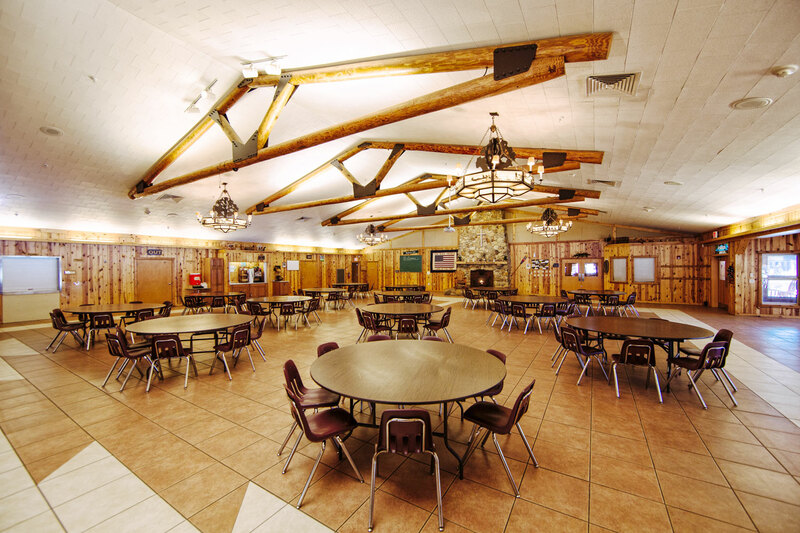 Lake Village’s main dining hall, Scheumann Lodge features two spacious meeting and dining rooms separated by a collapsible wall in addition to a cozy breakout space. 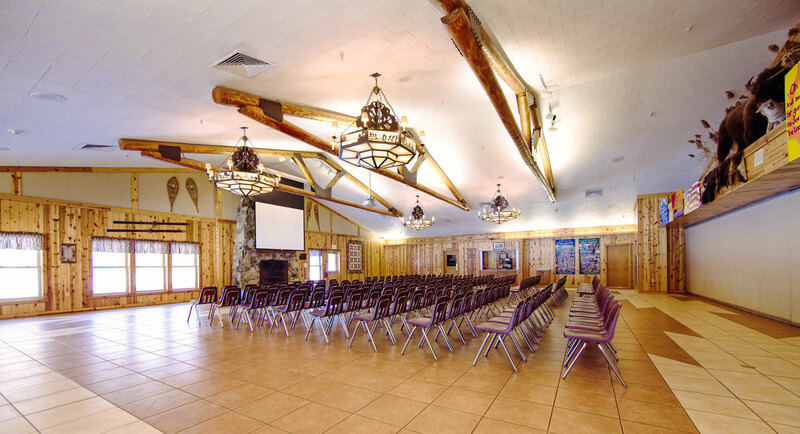 Huge log trusses, custom chandeliers, four fireplaces, and a state of the art AV system creates the perfect environment for conversation over a meal, small group discussion sessions, or large presentations. 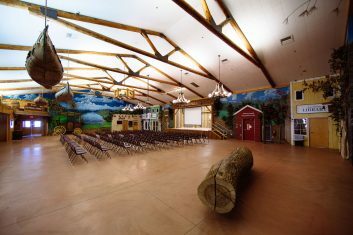 The primary dining hall in Lake Village, The Elk Room fits up to 400 people. Wired for sound, and featuring an HD projector and high speed wireless internet, the Elk Room features everything needed for large presentations. A collapsible wall separates the Elk Room from the Mountain Lion Room and can be opened to create additional space. 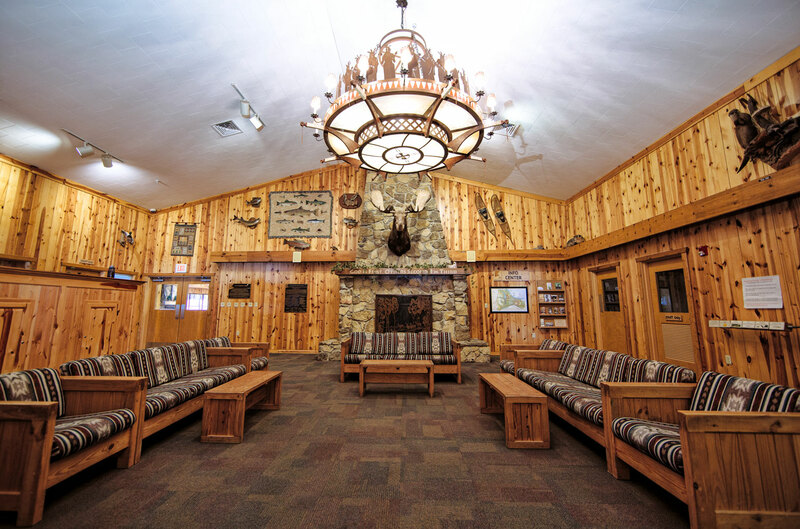 The back half of Scheumann Lodge, the Mountain Lion Room can accommodate up to 300 people. A collapsible wall separates the Mountain Lion Room from the Elk Room to create two large, separated spaces. Wired for sound, the Mountain Lion Room features an HD projector, high speed wireless internet, and paper easels. 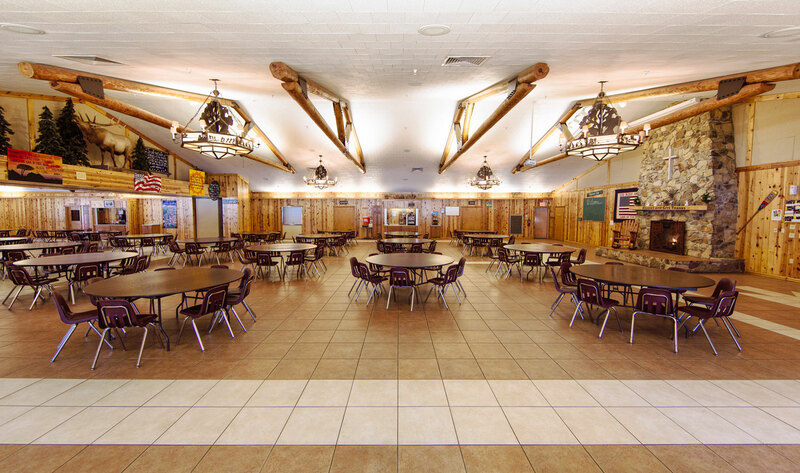 For large groups, the Mountain Lion Room can be used for additional dining space. The Fellowship Room is as versatile as it is visually striking. The perfect place for everything from large conference check-ins to small brainstorming sessions, the Fellowship Room is a hub of activity. 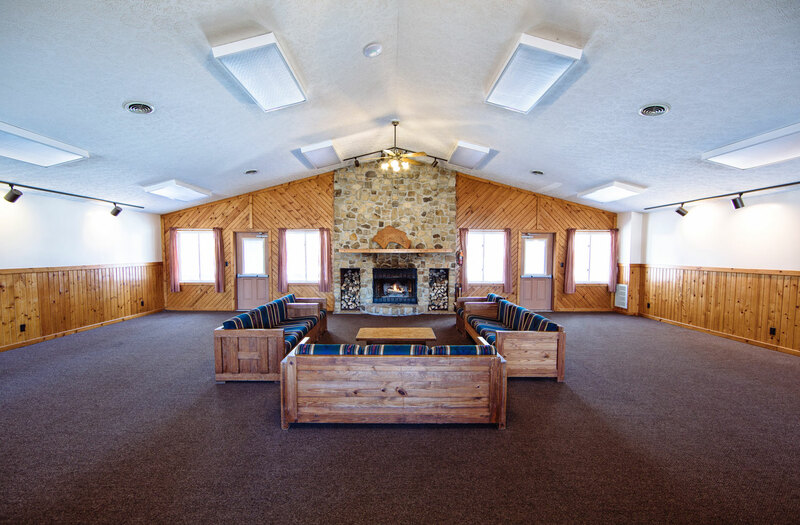 Accommodating up to 40 people, the Fellowship Room features high speed wireless Internet, paper easels, and a gas fireplace. A versatile and cozy meeting space. 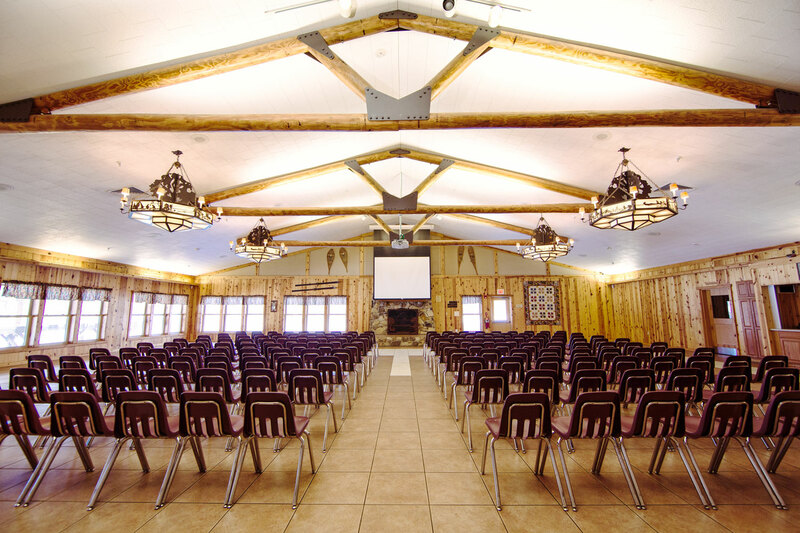 With numerous customization options, Whitetail Lodge is versatile enough for large presentations, interactive workshops, and small group discussion. 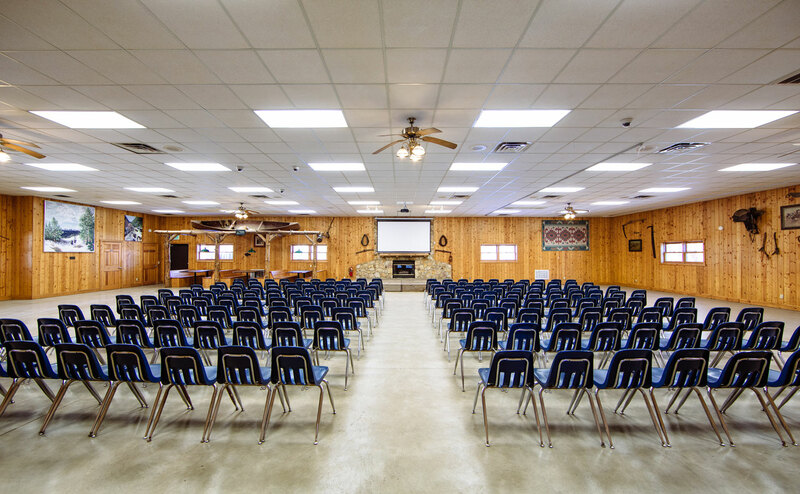 With room for 120 people, Whitetail Lodge is wired for sound and features an HD projector and screen, high speed wireless Internet, and paper easels. 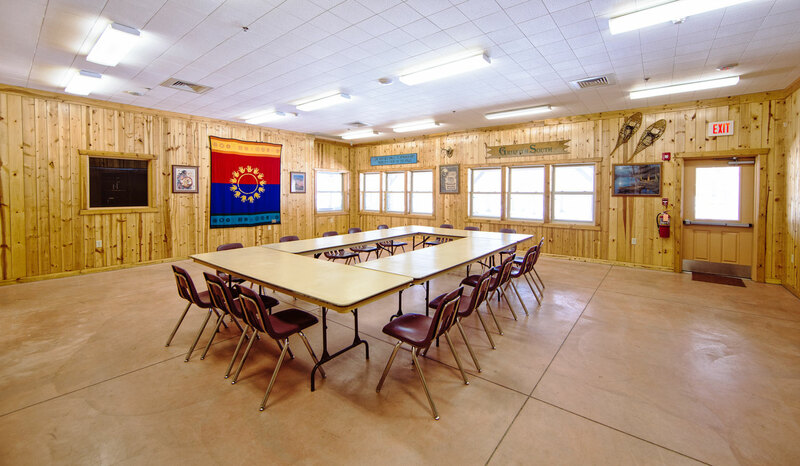 Whitetail Meeting Room also features a basement which can be used for breakout sessions and small group discussion. The Whitetail basement is also a storm shelter. 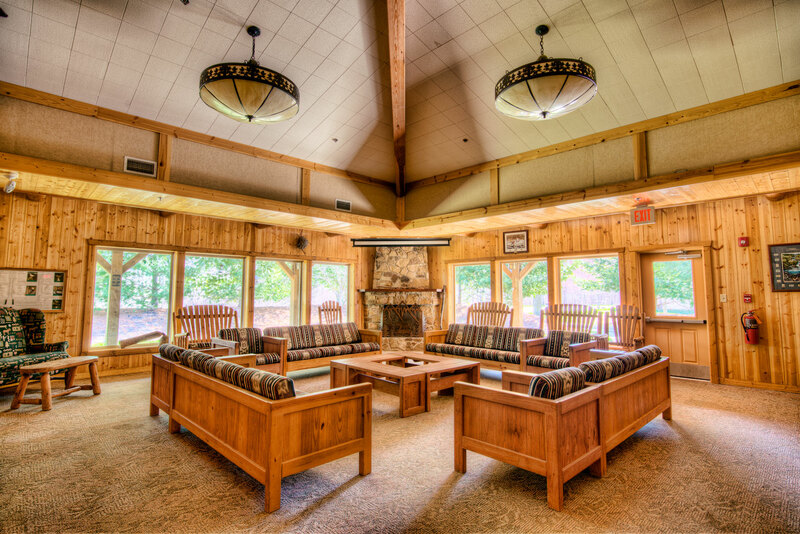 Overlooking the Richard G. Marsh Lake, Buffalo Lodge features four cabins and a central meeting room. Set up in a lecture format, the Buffalo Meeting Room can accommodate up to 60 guests. For smaller group discussions, a stone fireplace and comfortable couches create a cozy setting. 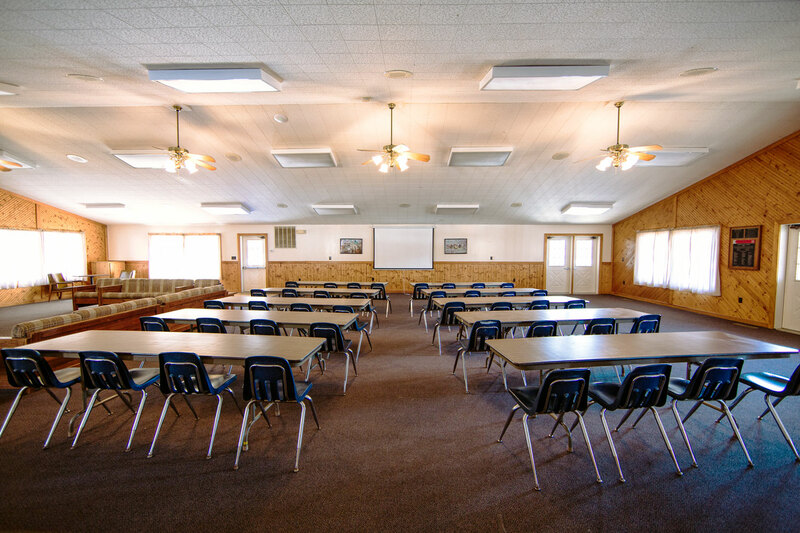 Buffalo Lodge features an HD projector and screen, high speed wireless Internet, and paper easels. A stone fireplace and comfortable couches create a cozy setting for small group discussion. 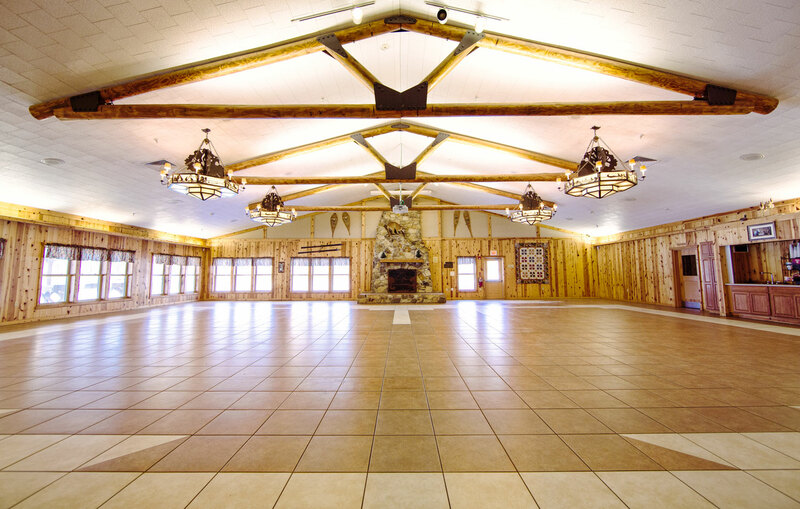 This beautiful, historic lodge is the only building that has been part of Camp Tecumseh since the camp opened in 1924. River Lodge is a centerpiece of River Village. 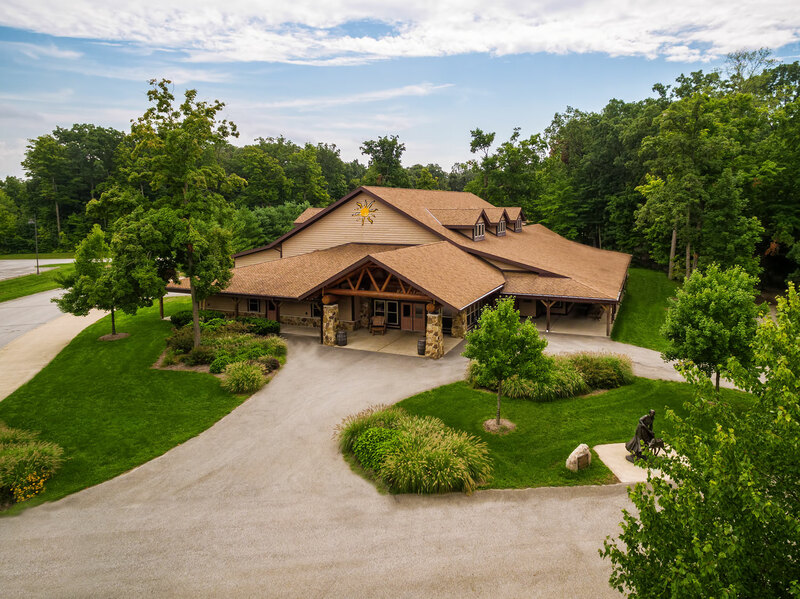 High above the Tippecanoe River, the lodge offers a spectacular setting and a memorable view. The lodge deck is a popular spot with campers who love to look up and down the river or just hang out with friends. A special observation telescope allows you to zoom in on water birds, turtles, canoeists, and even eagles and ospreys that perch near the lodge! 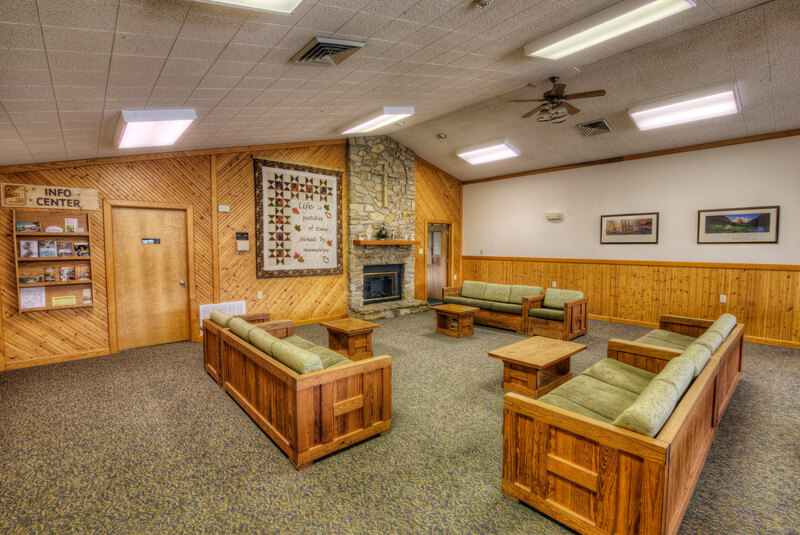 The River Lodge also has a nice fellowship room for casual conversations or indoor games. Dining rooms feature beautiful Indian stone carvings for all to enjoy. Camp offices are in the lodge as well. Located on the back side of River Village’s historic River Lodge, Heritage Hall can accommodate up to 150 guests. For larger groups, Heritage Hall can be used as additional dining space. An HD projector and screen, high speed wireless Internet, and paper easels are available in Heritage Hall. Heritage Hall also features a basement which can be used for breakout sessions and small group discussion. Featuring a look pulled straight from classic spaghetti westerns, the Creative Arts Center (CAC) is River Village’s largest meeting space. Accommodating up to 300, the CAC is wired for sound and features an HD projector and screen, high speed wireless Internet, and paper easels. From the outside it appears to be an old western street. Yet, when the imagination takes hold it becomes much more than that. The camp playhouse brings theatre to the life of the camper. The photographer’s shop captures moments and develops smiles. The pottery shop helps campers realize that they have the ability to create something wonderful. The Creative Arts Center (CAC) is the River Village’s center for crafts, games, and a wide array of creative opportunities. From pottery and painting to basket making and performances, every great camp needs a wonderful place for campers to hone and display their creativity. Camp Tecumseh has one of the best. As an added attraction, the interior space can also be used for indoor rock climbing or indoor archery. Rain never dampens our time at Camp T. When the rain comes, we just move everyone in to the CAC and keep up the fun. The Frances Bradshaw Nature Center offers an experience that rivals many state parks. Live animal displays include snakes, turtles, lizards, and fish. An active beehive provides a birds-eye view into the life of a colony. Mounted animals provide a snapshot of animal life in North America. 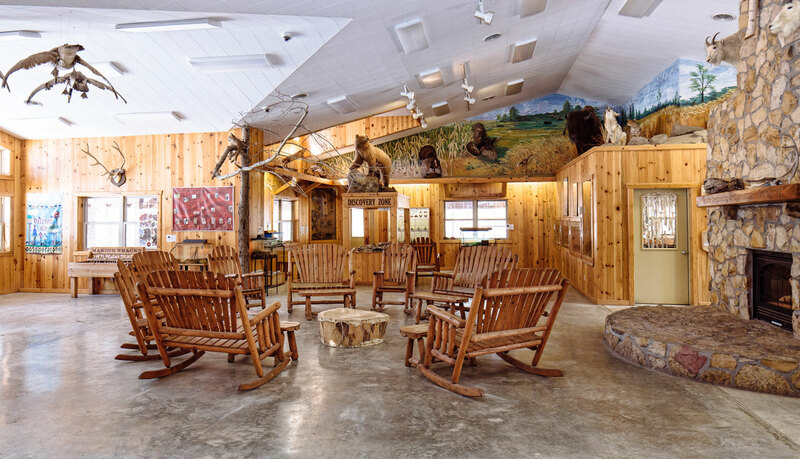 Best suited to small group discussion of 30 or less, the Nature Center is the perfect venue to get the creative juices flowing. Paper easels are available. 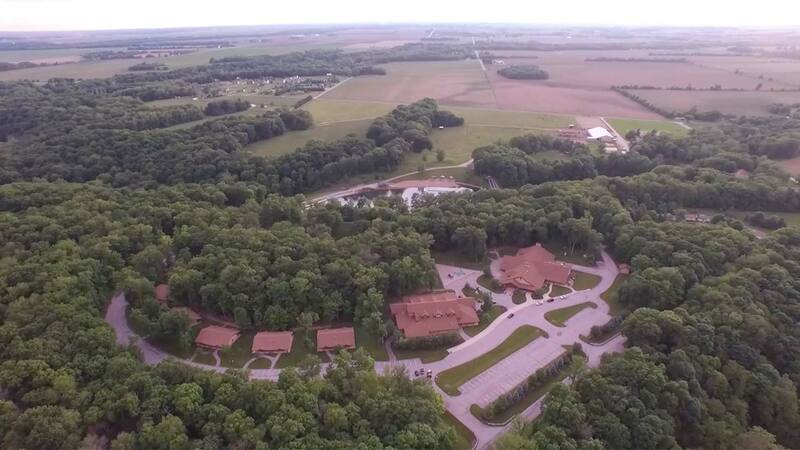 The Frances Bradshaw Nature Center offers an experience that rivals may sate parks. Live animal displays include snakes, turtles, lizards, fish. An active beehive provides a birds-eye view into the life of a colony. Mounted animals provide a snapshot of animal life in North America. 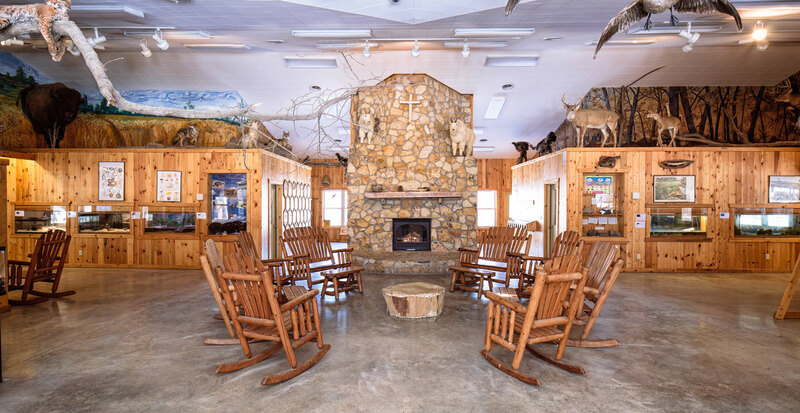 Best suited to small group discussion of 30 or less, the Nature Center is the perfect venue to get the creative juices flowing. Paper easels are available. 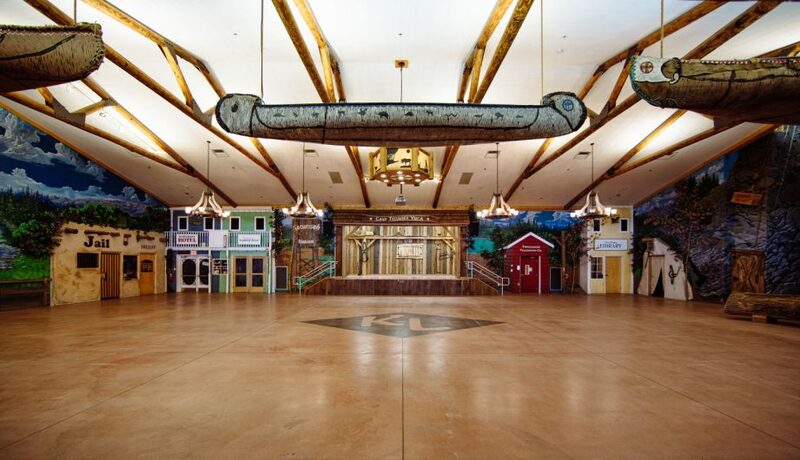 Located in the Oregon Territory next to the Pine Forest, Trader Jim’s can accommodate up to 125 people. It also functions as an above ground storm shelter. Paper easels are available in Trader Jim’s.